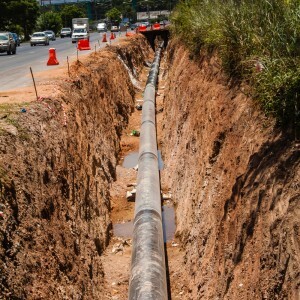 We are licensed gas line contractors, and Mike is a master plumber with a high degree of experience, qualifications and knowledge regarding plumbing, HVAC and gas line installation and repairs. If you smell rotten eggs or hear a hissing near a gas line and suspect you have a gas leak, leave the premises immediately and call your gas company from a safe location. CALL 911 promptly after evacuating the area. DO NOT smoke or light a match, candle or other flame. DO NOT turn electrical devices on or off, including light switches. DO NOT start an engine or use any device, including a telephone, which could cause a spark. DO NOT attempt to control the leak or repair the damaged pipe or meter yourself. We offer emergency plumbing and emergency gas line repair 24/7, 365 days a year. Once the gas company has shut off the gas and the emergency has passed, call us and we’ll get a crew out to your location right away. Our trucks are fully stocked with all of the necessary tools, parts and piping needed to complete any repairs.